Electronic cigarettes (“e-cigarettes”) are battery-operated devices that look like cigarettes but do not burn tobacco. Instead, e-cigarettes have replaceable cartridges of liquid containing nicotine, which is inhaled as a vapor along with flavors like tobacco and chocolate. e-Cigarettes are available in stores, mall kiosks and over the Internet. Advocates of e-cigarettes see them as a healthier alternative to tobacco smoking—perhaps even as a way for smokers to quit. In addition, as smokeless devices e-cigarettes do not create secondhand smoke. Critics of e-cigarettes are concerned that they may have not-yet-determined health risks and may encourage people—including youth—to smoke tobacco. Currently, e-cigarettes are not regulated by the US Food and Drug Administration (FDA), and e-cigarettes may be sold without regard to the age of the purchaser. The C.S. Mott Children’s Hospital National Poll on Children’s Health presented arguments for and against e-cigarettes, and then asked a national sample of adults for their opinions regarding e-cigarettes and possible regulations and laws. 37% of adults have heard of e-cigarettes, while only 3% have ever tried one. Nearly half of adults (49%) are very concerned that e-cigarettes may increase nicotine and tobacco use among youth, and 42% are very concerned that it is easy for youth to buy e-cigarettes. 17% of parents are very concerned their children will try e-cigarettes. Although there is little current evidence about the effects of e-cigarettes, 68% of adults think e-cigarettes should have health warnings like tobacco cigarettes and nicotine products. Adults express widespread support for new laws regarding e-cigarettes (Figure 1): 91% think manufacturers should be required to test e-cigarettes for safety, and 85% favor prohibiting the sale of e-cigarettes to minors. Strong majorities also support FDA regulation of e-cigarettes like that of other nicotine-containing products, marketing restrictions on social networking sites often frequented by youth, and prohibition of e-cigarette use indoors. 68% of adults think e-cigarettes should have health warnings like cigarettes and nicotine products do. 85% of adults support laws that would prohibit e-cigarette sales to minors. E-cigarettes are a relatively new product with little information about safety or long-term health effects. It is clear from this poll that US adults are not waiting for scientific evidence. Rather, they support restrictions on e-cigarettes based on potential risks—not just short-term health effects, but also the possibility that e-cigarettes may prompt youth to smoke tobacco. These findings add to the public dialogue about e-cigarettes, which has chiefly consisted of claims and counter-claims by advocates and opponents of these new devices. Adults’ high level of concern—including easy availability of e-cigarettes for youth—explains their broad support for many potential new laws and regulations. This poll indicates widespread support for e-cigarette initiatives being considered by state legislatures, including warning labels, bans on sales to minors and advertising restrictions in youth-targeted media. Public support is also strong for FDA regulatory action regarding e-cigarettes, similar to other nicotine-containing products. Given these results, in order to gain more public support, advocates of e-cigarettes must provide more detailed evidence about safety and make clear their intentions about marketing to youth. Meanwhile, critics of e-cigarettes may want to move now with legislative action likely to gain strong public backing. This report presents findings from a nationally representative household survey conducted exclusively by Knowledge Networks, Inc, for C.S. Mott Children’s Hospital via a method used in many published studies. The survey was administered in May 2010 to a randomly selected, stratified group of adults aged 18 and older (n=2,064) with and without children from the Knowledge Networks standing panel that closely resembles the U.S. population. The sample was subsequently weighted to reflect population figures from the Census Bureau. The survey completion rate was 61% among panel members contacted to participate. The margin of sampling error is plus or minus 1 to 3 percentage points, depending on the question. Davis MM, Singer DC, Butchart AT, Clark SJ. For e-cigarettes, public supports health warnings & ban on sales to minors. C.S. Mott Children’s Hospital National Poll on Children’s Health, University of Michigan. Vol 10, Issue 4, September 2010. 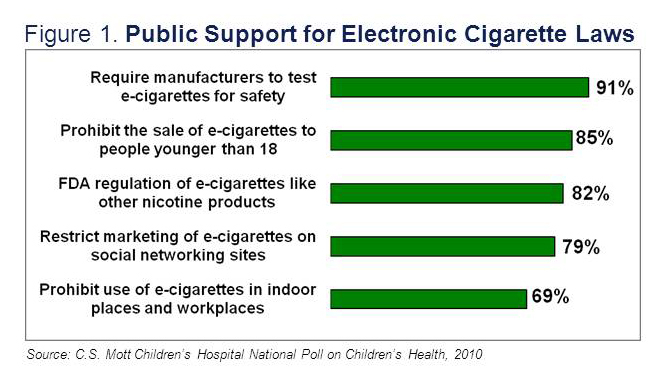 Available at: http://mottpoll.org/reports-surveys/e-cigarettes-public-supports-health-warnings-ban-sales-minors.